Your bathroom is one of the most used rooms in your home, but probably the one that gets the least attention, decor-wise. If you were to plan your next exciting home improvement project, a new bathroom is probably down on your list of your priorities. Cost is a big factor that puts people off redecorating their bathroom, but what if you could do it on the cheap? Take a look at these great ideas to give your bathroom a makeover on a budget. Take a good honest look at your bathroom, is it looking as good as it could? Are there units in need of some TLC or some tiles that even bleach can’t bring back to life? It could be time to make a change. Pick out the elements which are repairable or easy to upgrade rather than investing in brand-new everything - this will help to keep the cost of your bathroom makeover down while helping you to reduce waste by making the most of the bits you already have. It’s surprising what a deep clean can do to transform the look of your bathroom. Even if you think your bathroom is clean and tidy, take the time to give it a thorough deep clean. Use products containing bleach to bring your bathroom back to life (remember to use gloves and ventilate appropriately), while mould removal products can work miracles in your bathroom. Getting rid of black mould is one of the trickiest parts of cleaning a bathroom, but you might find that your bathroom needs much less work after you’ve managed to get rid of it. Try to stay on top of dust and dirt by giving your bathroom a regular wipe-down - it doesn’t take much work to keep a bathroom clean if you do little bits between deeper cleans. There are a lot of options available to you when it comes to bathroom flooring. With so many options for vinyl paneling and affordable tiling, you can choose from a wide selection of bathroom flooring that can achieve the same look as materials costing 5x the price. It’s worth browsing bathroom floor ideas to find things that you like before looking into other options that borrow the same colours and design at a lower cost. Vinyl, in particular, is a great material for your bathroom floor. It’s easy to clean, comes in various finishes and is easy to install. Vinyl is a very affordable option when it comes to refreshing your bathroom and can be changed frequently according to your tastes. If you’ve got limited time and money to makeover your bathroom, then a fresh coat of paint can work wonders. By changing the colour of your walls, you can give your bathroom an instant facelift that will make it look like a whole new bathroom. If you have white bathroom furniture and suite, for example, you could opt for a colour that will make them stand out more in your bathroom such as a charcoal or a teal. Design a colour scheme that will work to enhance the items you already and use Pinterest as a great place for inspiration. If you can’t replace your entire bathroom suite, there are some items that you can replace that will give your bathroom a new lease of life without costing an arm and a leg. A new mirror, sink unit, or even just changing the taps can give your bathroom a more modern look. There are good deals for Roper Rhodes available at Drench that can save you money on high-quality bathroom products. Even simple ideas like adding a vanity unit will give your bathroom something extra, without you needing to replace everything to achieve a new look. The lighting scheme of your bathroom can make a huge difference to how it looks. Too dark and it will appear too dull and difficult to see, while too light will make you feel like you’re at the dentist or GP. Think of how you want your bathroom to look. A softer look and feel such as a more vintage-style bathroom can benefit from some warm lighting, while contemporary bathrooms suit white lights bright LEDs.You can upgrade your bathroom lighting by adding in illuminated mirrors, spotlights, and lights in your units. Installing a dimmer is a great way to be able to transform your bathroom into somewhere to relax when you want to - creating that spa-like atmosphere that is perfect for your home. Adding candles is another way to transform the mood of your bathroom, creating subtle lighting effects while also bringing some beautiful fragrances into your room. Feature walls are a popular bathroom décor trend at the moment. It’s an easy piece of DIY to do, and you don’t have to spend a fortune on expensive materials to get it right. You can create a wood-effect wall that will really transform the look of your bathroom, and can be done without even having to invest in any wood. Another option is to tile one wall of your bathroom while keeping the others painted or adding some artwork to your walls instead. If you’ve got a blank canvas that you can work with - go for it, the effect will be much greater than you can imagine. You can buy some wonderful bathroom accessories without having to spend a fortune. Shops like Matalan, Primark, and H&M offer bathroom accessories that incorporate the latest trends without the heavy price tag. 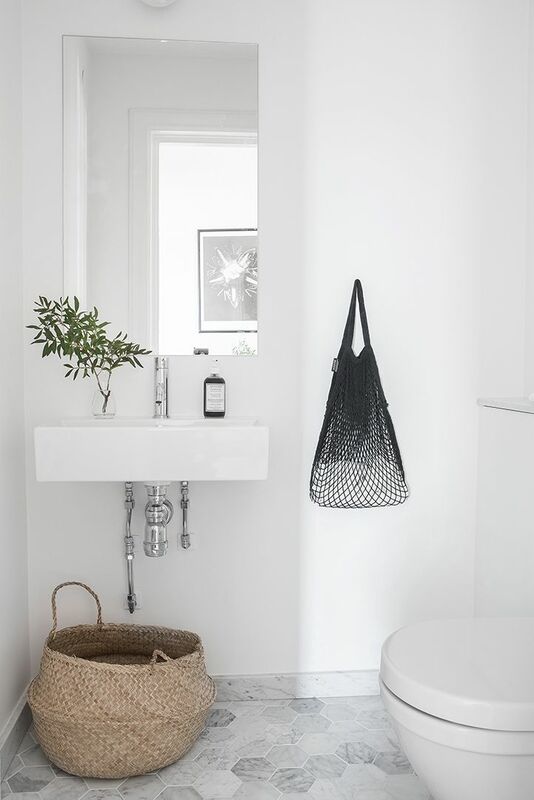 Switching up items such as your toothbrush holder, bathroom bin and toilet brush holder are simple things you can replace to suit your new theme. You’ll be surprised at the variety of bathroom accessories that are available to buy now, so it’s worth having a browse to see if there’s anything that takes your fancy. Bathrooms can be a cluttered place, especially with all of those products lying around. If you can find places to put them so that the bathroom looks neat and organised, you’ll find that your bathroom feels much larger and cleaner while being easier to maintain too. Shelving can be a fantastic way to display your products, especially if you love collecting fragrances or have a few knick-knacks in your bathroom. Even if your bathroom is small, there are some effective storage solutions that will be able to help you to make the most of your space. There are some great places to pick up deals on good bathroom items, and you shouldn’t be put off buying second hand. Items such as vanities, mirrors, and storage units can be found easily at boot sales and websites like Gumtree or eBay, offering you a bargain price on a much more valuable item. Some items might need a bit of upscaling, but it’s better to have a project than to spend a fortune on a brand new item when your budget is tight. Giving your bathroom a makeover is a great idea for breathing new life into your home and making the most out of your space. There are so many solutions and hacks available for transforming your bathroom on a budget that you’ll wonder why you haven’t considered them before. Your bathroom is somewhere that you’ll use every day, so make it somewhere you enjoy being and give it a whole new look this season.